I learned about this William Spence years ago when I first started doing genealogy. Someone posted a question about him on a discussion board: his wife’s name was Phoebe Forehand. Had anyone ever heard of him? Well, I hadn’t. Curiosity seized my interest, but I quickly lost interest when I could discover nothing about him. My renewed interest in him developed this week when I found a picture of his gravestone on Ancestry.com. This picture was originally posted there by RobertDennison91 to the Dennison/Harrington/Brown/Tidwell/Parker families Family Tree. And after devoting a greater part of the week to William Spence, I can now tell who he wasn’t and who he was. 2. William Spence (1802-1831 )–[My Note: this William has been confused with William (born 1795). They are not the same person. This William was born 25 Feb 1802 in Pasquotank County, North Carolina, and he died 27 Dec 1831 in Pasquotank. He remained single and did not leave Pasquotank County. 5. 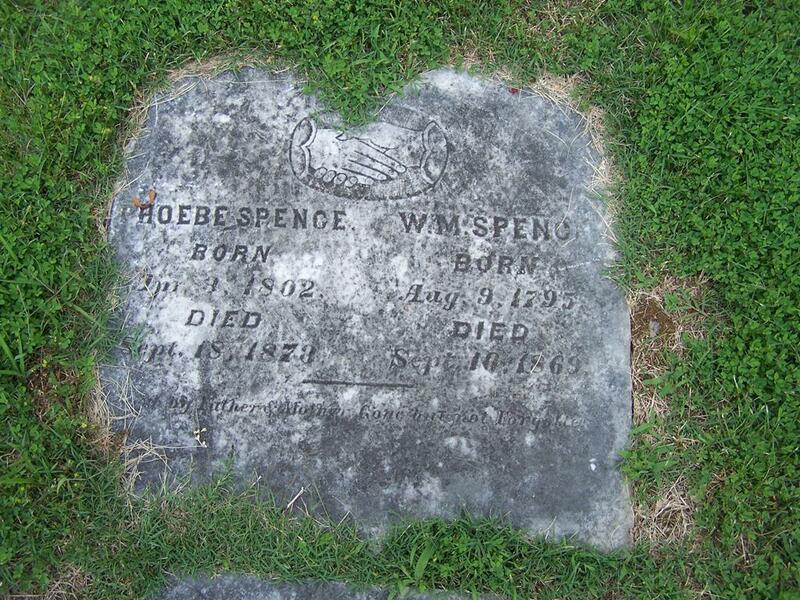 Elisha Spence (born 29 Mar 1810 in Pasquotank County; died 9 Nov 1827 in Pasquotank County). He married Nancy Wood. David Spence, son of Thomas and Sarah Harriman Spence, was born about 1758 in New Jersey, d 1839 or before Apr 1840, Robertson Co., TN. He married Mary Ann McElyea, dau of Lodwick and May or Mary (Powers) McElyea, about 1783, Surry Co., NC. She was b Oct 1763 in PA, probably York, Co. d about June 1863, at the advanced age of ninety nine years, eight months and 20 days, near Only (then Dunnington) Hickman Co., Tn. They lived in Hickman County, Tennessee at one time. At most, they may have been acquainted with William (1795), but they were not related. The third placement for William (1795) is for people to add an “r” to his last name and make him a Spencer instead of a Spence. And none of the Spencer trees work for him either. He was definitely a Spence and not a Spencer. SO WHO WAS WILLIAM SPENCE? William relocated to Hickman and settled on his land in 1845, and he appears on the 1850 and 1860 Census Records there. There is a Tennessee Supreme Court Case of record in 1852 titled Robert A. Hill, exe. of William Whitefield v. William Spence. (7) As yet, I do not know the details of that case, but it did involve this William Spence. He died September 16, 1869 in Hickman County. 1. Narcissa Spence. Narcissa was born 31 Jan 1825, Davidson County, Tennessee and she died 18 Jan 1911 in Hickman County, Tennessee. Her husband was Robert Franklin Bratton, Jr. (1823-1900). Their children were: Thomas Miles Bratton (1847-1934); William H. Bratton (1848-1938); Martha J. Bratton (1851-1876); John S. Bratton (1856-1921); George W. Bratton (1857-1927); Lonnie F. Bratton (1860-1934)–his name may have been Lou, or there was a son named Lou who would have been Lonnie’s twin; Mary E. Bratton (born 1865). 2. Rebecca Jane Spence. Rebecca was born 13 Sep 1830, Davidson County, Tennessee and she died 9 Nov 1899 Little Lot, Hickman County, Tennessee. On October 2, 1849, she married John Gill Anderson (1827-1900) in Hickman County, Tennessee. Their children were Matilda E. Anderson (1854-1862); Eliza J. Anderson (1856-1856); William H. Anderson (born 1857); Mary J. Anderson (born 1860); Thomas Lee Anderson (born 1862); Nancy Anderson (born 1863); Marian Anderson (born 1866); Mary L. Anderson (born 1867); Margaret “Maggie” A. Anderson (1869-1959); John S. Anderson (1871-1892). 3. Miles Spence. Miles was born in 1830 in Davidson County, Tennessee and he died in 1849 in Mississippi. He married Nancy Spence Campbell (1830-1846). I have no additional information about them. 4. Mark A. Spence. Mark was born 6 Dec 1834 in Davidson County, Tennessee and he died 8 Apr 1906 in Centerville, Hickman County, Tennessee. His wife was Louisa C. Gill (1837-1880). Their children were: Miles Spence (1856-1946); Alma Spence (1858-1952); Samuel Gill Spence (1860-1940); Anna Z. Spence (1866-1948); William A. Spence (1868-1949). I found a picture of Mark Spence, which I am posting here because he resembles some of the Spences in my family. This picture was originally posted on Ancestry.com by bsdunagan to the Roots Family Tree. 5. Nancy Elizabeth Spence. Nancy was born 13 Nov 1836, Davidson County, Tennessee, and she died 26 Sep 1874 in Little Lot, Hickman County Tennessee. She married Robert A. Dean (1829-1880) in 1872, Hickman County, Tennessee. I have no additional information about them. 6. John David Spence. John was born 6 Dec 1844, Davidson County, Tennessee, and he died 30 Oct 1903 in Dyer County, Tennessee. He married Emily or Emma J. 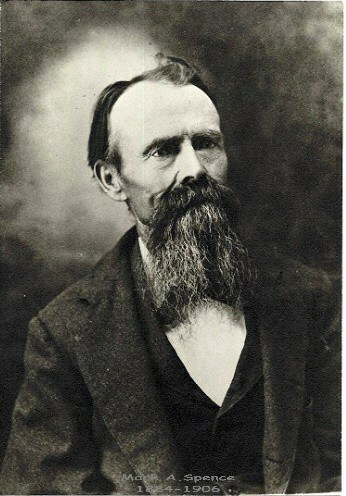 Hunter (1847-1903) on November 18, 1869 in Hickman County, Tennessee. Their daughter was Eva Cleggett Spence (1874-1911). I do not know whether they had ay additional children. 7. Tennessee C. Spence. Tennessee was born 26 Jan 1845 in Davidson County, Tennessee, and she died 18 Aug 1914 in Little Lot, Hickman County, Tennessee. On November 30, 1865, she married James Drury Harrington (1845-1908) in Hickman County, Tennessee. Their children were: Ida May Harrington (1869-1915); William D. Allen Harrington (1873-1947); Mary Harrington (born 1876); John M. Spence Harrington (1878-1962). Despite his humble beginnings, William Spence (1795) lived a successful life and enjoyed a wonderful family. I believe that he was an orphan from one of the Pasquotank/Camden Spence families, but I have no idea which one. Hopefully, I will be able to discover his origins. (1) Spence, Wilma Cartright and Edna Morrisette Shannon House, The Spence Bible in North Carolina Bible Records: Dating from the Early 18th Century to the Present Day, including Genealogical Notes and Letters Found in some Bibles. Logan Utah: Unique Printing Service (1973), pp. 357-359. (2) Fowler, Louise Bishop, David and Mary (McElea) Spence: Their Ancestors and Descendants. Gateway Press, Baltimore (1986). (3) Fowler, Louise Bishop, David and Mary (McElea) Spence: Their Ancestor and Descendants. Gateway Press, Baltimore (1986). (4) Spence, Jerome D. and David L. Spence. A History of Hickman County, Tennessee. (1900) p. 94. (5) Spence, Samuel. Last Will and Testament, 1805. Pasquotank County, North Carolina Wills. (6) Spence, Jerome D. and David L. Spence. A History of Hickman County, Tennessee. (1900) p. 94. How true. Once in the wrong family, forever in the wrong family. Got to get back to Ancestry, but I want to kill my computer first. Apparently I’m one of Ida’s descendants on my mom’s side. We’re related via the Edmason (Edmison) family.